Prolonged and repeated contact with engine oil will result in the removal of natural oils from the skin, leading to dryness, irritation and dermatitis. In addition, used engine oil contains potentially harmful contaminants which may cause skin cancer. Precautions should be taken when replacing engine oil to minimize the risk of your skin making contact with used engine oil. Protective clothing and gloves that cannot be penetrated by oil should be worn. The skin should be washed with soap and water, or use waterless hand cleaner, to remove any used engine oil thoroughly. Do not use gasoline, thinners, or solvents. In order to protect the environment, used oil and used oil filters must be disposed of at designated disposal sites. 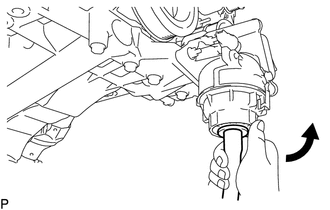 (b) Remove the oil pan drain plug and drain the engine oil into a container. (c) Install a new gasket and the oil pan drain plug. (a) Connect a hose with an inside diameter of 15 mm (0.591 in.) to the pipe. 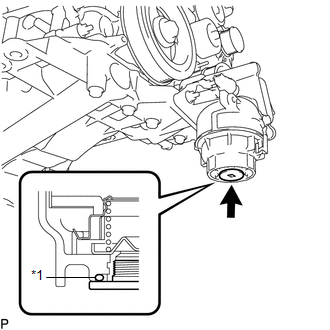 (b) Remove the oil filter drain plug from the oil filter cap assembly. 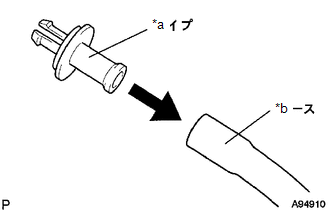 (c) Install the pipe to which the hose was attached to the oil filter cap assembly. If the O-ring is removed with the drain plug, install the O-ring together with the pipe. Use a container to catch the draining oil. (d) Check that oil is drained from the oil filter. 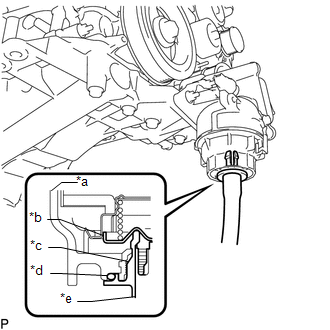 Then, disconnect the pipe and remove the O-ring (for drain plug) as shown in the illustration. 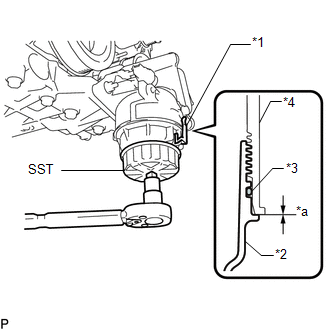 (e) Using SST, remove the oil filter cap assembly. Do not remove the oil filter bracket clip. 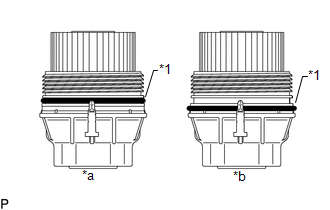 (f) Remove the oil filter element and O-ring (for Cap) from the oil filter cap assembly. Be sure to remove the O-ring (for Cap) by hand, without using any tools, to prevent damage to the groove for the O-ring in the cap. 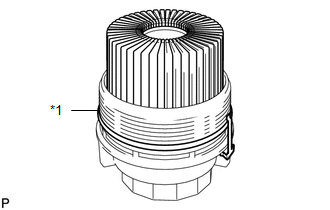 (a) Clean the inside of the oil filter cap assembly, the threads and O-ring groove. (b) Apply a small amount of engine oil to a new O-ring (for Cap) and install the O-ring (for Cap) to the oil filter cap assembly. Be sure to install the O-ring (for Cap) in the proper location, otherwise oil may leak. Do not twist the O-ring (for Cap). (c) Set a new oil filter element on the oil filter cap assembly. (d) Remove any dirt or foreign matter from the installation surface of the engine. (e) Apply a small amount of engine oil to the O-ring (for Cap) again and temporarily install the oil filter cap assembly. Do not pinch the O-ring (for Cap). 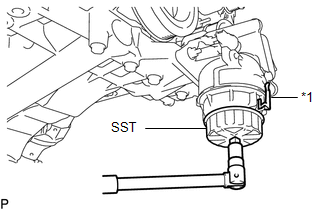 (f) Using SST, tighten the oil filter cap assembly. When tightening the oil filter cap assembly, do not remove the oil filter bracket clip. After tightening the oil filter cap, make sure that there is no gap and that the O-ring (for Cap) is not protruding. (g) Apply a small amount of engine oil to a new drain plug O-ring (for Drain Plug) and install it to the oil filter cap assembly. Before installing the O-ring (for Drain Plug), remove any dirt or foreign matter from the installation surface of the oil filter cap assembly. (h) Install the oil filter drain plug. Make sure that the O-ring (for Drain Plug) does not get caught between the parts. 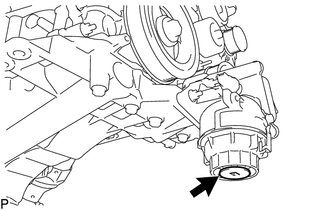 Do not allow engine oil to adhere to the moving parts of the belt tensioner, as this may cause malfunctions. 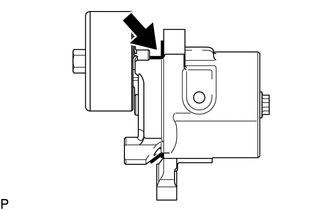 If engine oil is on the location indicated by the arrow, replace the belt tensioner. (a) Start the engine. Make sure that there are no engine oil leaks from the area that was worked on.